Margery Williams’ children’s novel about a little velveteen toy rabbit and his quest to become ‘real’ was first published in 1922 and is now being brought to stage to enchant 4+ year olds at Unicorn Theatre in London Bridge. Unicorn Theatre, for those who haven’t been, is a delight. Designed with children in mind, a lovely little mezzanine-level children’s library on the way to the top-level auditorium is a particular highlight and the auditorium itself is well-spaced with tiered seating so even the littlest of guests can see all the action. Which is a very good thing with this highly visual production of The Velveteen Rabbit. Giant toys, impromptu snow storms, vegetable gardens and a giant bed that doubles as a pirate ship are wheeled out in succession as one young boy and his little toy rabbit engage in various adventures. It’s sweet, certainly, but it avoids becoming saccharine largely due to Christian Roe’s unassuming portrayal of the rabbit. Dressed in a brown waistcoat and increasingly tatty jacket, there are no twee bunny ears or painted whiskers here, just wide-eyed wonder and a rather poignant acceptance of his fate at the hands of his young owner. And when things get rough, they get rough. We’re not spared the “he’ll have to be burnt” line, which draws a collective gasp from young and old alike. Although some of the smaller moments of tragedy — rabbit being tossed carelessly from the bed — prompt squeals of laughter in their appeal to the particular schadenfreude of children. In all, it’s smartly done. Jokes for the adults mix nicely with the nostalgia of the story, while we’re sure more than a few little ones went home, dug out old Ted and kept a rather tight hold on him all night. 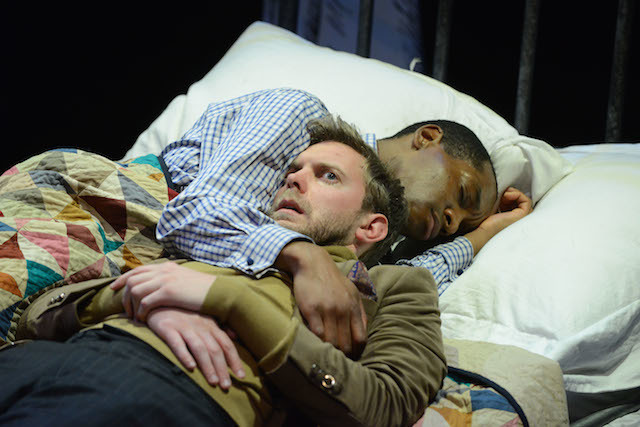 The Velveteen Rabbit is at Unicorn Theatre, 147 Tooley Street, SE1 2HZ until 19 April 2014. For more details and to book tickets, visit the Unicorn Theatre website. Londonist saw this play on a complimentary review ticket.